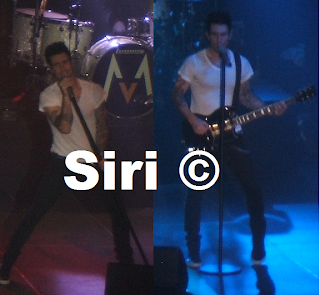 Yesterday...♥ Yup, Maroon5 came to Finland, yaaay! As espected, they started with "Moves Like Jagger". I thought Christina's part was coming as playback, but Adam actually sang her part! He was so good! There came some lovely songs randomly, but when "This Love" came people just went crazy, everybody was shouting and singing the lyrics. It was the real highlight! When they had played for a bit over 1 hour they went off the stage and said byes but everybody just kept screaming and clapping for the encore. I really got in panic cause I thought it was the last song, and they hadn't played "She Will Be Loved" yet!